If you think the weather in Grand Forks the past 5 months hasn’t felt quite right, your not the only one. According the the National Weather Service (NWS), Grand Forks experienced the 3rd warmest fall (Sept-Nov) on record averaging around 47 degrees. Given the cold weather we experienced in October, that may be hard to believe but September and November were both as warm as October was cold. Snowfall during the same period was only 0.7 inches (a snowfall famine) and was 6.7 inches below average for that period according to the NWS. As a snow lover, the snow famine during that period was disappointing, but the balmy November was tolerable. In December the temperature was below normal averaging around 7 degrees and continued the seesaw monthly temperature trend. The snowfall famine of only 0.7 inches was over as soon as the we turned the calender from November to December. The first two days of the month we received around 5 inches of snow, a welcome sight considering it was December. After receiving some welcome snowfall, the snowfall famine hit again and measurable snowfall (in my terms: more than a dusting) would not return for over 20 days. The snow famine in December ended in record fashion with a snowfall feast, the Christmas Blizzard. 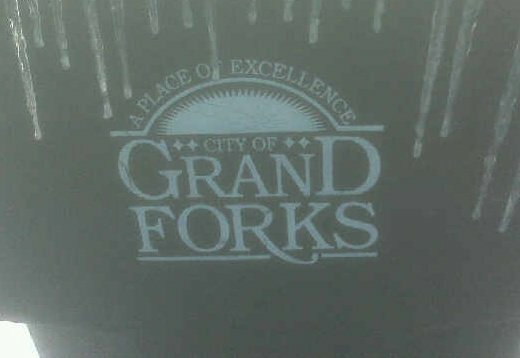 When all was said and done, Grand Forks received 25.5 inches of snow. We also set a single day snowfall record on Christmas with 15.5 inches of snow. Snowfall totals from Christmas Blizzard. Since the Christmas Blizzard, the snowfall famine has reared its ugly head once again. 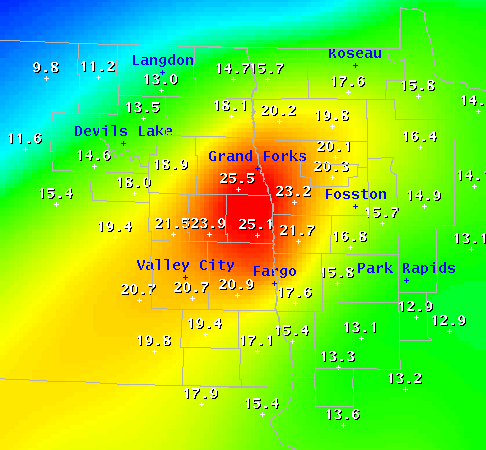 Grand Forks hasn’t had more than an inch of snow in a 24 hr period since the blizzard. Forecast models have been hinting at a major famine buster starting sometime next weekend, nearly a month since the last snowfall feast over Christmas. Have to keep an eye on the possible storm next weekend but a lot can change from now (Sunday 17th) and then. One would think, from a non-meteorological standpoint, that this snowfall famine is due to end sometime soon. In the Red River Valley, springtime flooding is always a major concern. One of the reasons I started looking into the snowfall was because of spring flooding. The massive amount of snow we received from the Christmas storm would naturally make people worry, especially after the flooding that occurred in the Spring of 09. Prior to the Christmas Blizzard, Grand Forks had received around 0.1 inches of precip. The average precip for the month of December is 0.58 and the blizzard dumped nearly 1.0 inch of precip on Grand Forks, in one sitting. Now if that storm doesn’t happen, and the snowfall famine was still in play, we would be 0.48 inches below the December normal. So far in the month of January we are sitting at 0.03 inches of precip and according to NWS climate data, that is around 0.3 inches below average. With a potential snowfall snowstorm looming this weekend, it could be a famine buster much like the Christmas Blizzard was. If that happens, a year from now we will look back at the precipitation and snowfall totals for December and January and think it was a stormy couple months when in reality, the snowfall that occurred, was feast or famine. « Cowboys and Vikings thoughts.